Have you uploaded your raw DNA files to GEDMatch.com? If not, you should consider it. Not only is there the possibility of connecting with new cousins who tested with different DNA companies, there are some nifty tools not available anywhere else. There are a variety of chromosome mapping tools that allow you to analyze your DNA in a variety of ways. Just a brief note about my ancestry before we get started so you’ll have something to compare the charts to. My dad’s side is 100% French…Southern France, Basque region…most of my ancestors well into the 1700s came from the same towns. This pie chart represents how the Eurogenes K36 utility sees my genetic makeup. Let’s see what it looks like in chromosome painting. 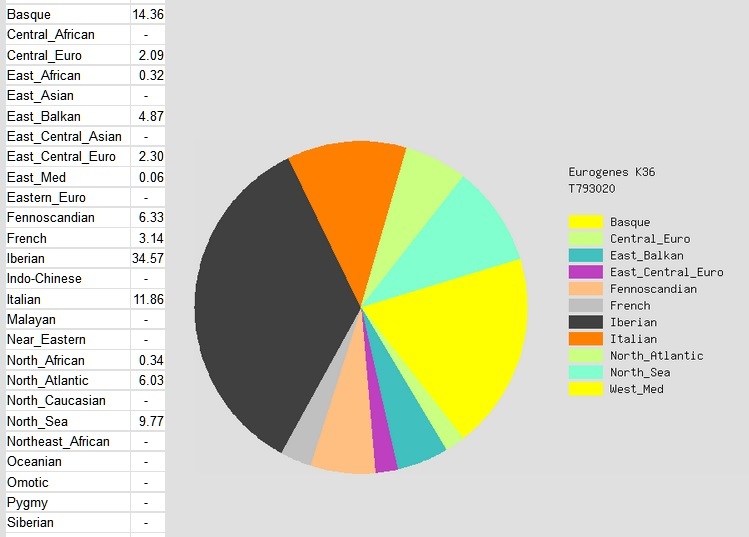 These tools are found on the main page in the middle column under Admixture (heritage) in the Analyze Your Data section. On the Admixture Utilities screen, select one of the projects. Choose Chromosome Painting (reduced size). On the next screen, enter your GEDMatch number, chose a calculator from the drop down menu, and submit. What Does Chromosome Painting Look Like? 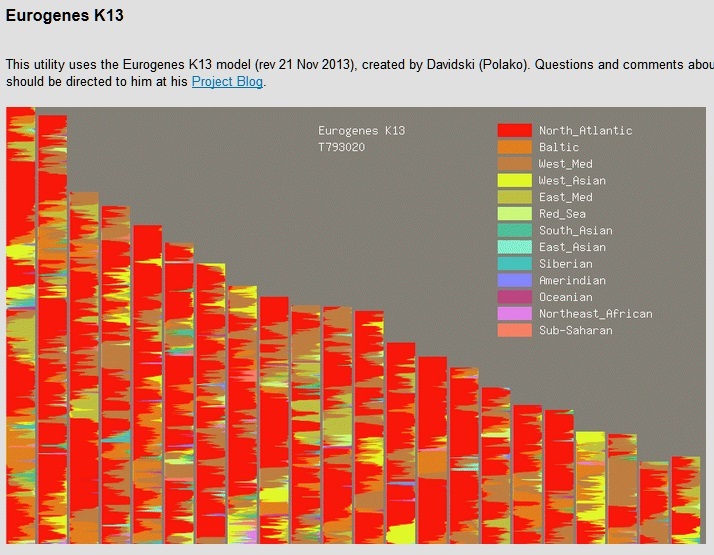 This example uses the Eurogenes K13 utility. It tests your DNA to 13 different regions. I’m a lot of red, aren’t I? That represents the North Atlantic region. 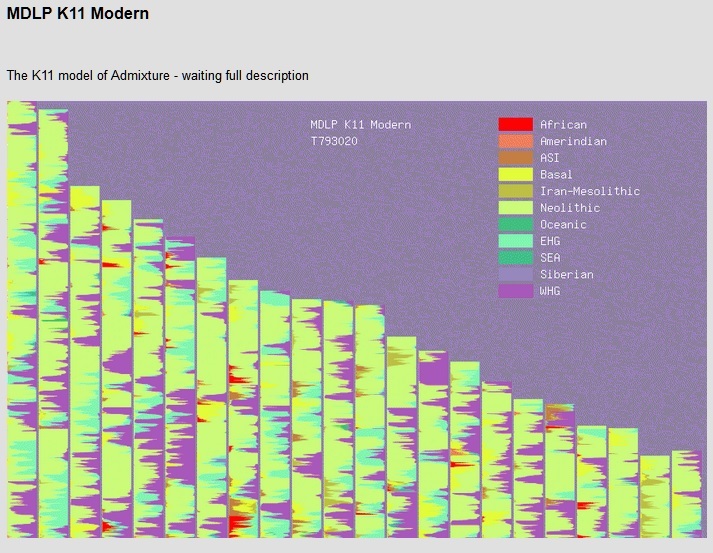 This project compares your DNA to 36 different regions. See all the brown? That’s my Iberian roots, my maternal paternal line in the Azores. The grey is French and the yellow Basque. This represents my dad’s side of the tree. I find it interested that the French DNA is not better represented on this chart since my paternal side is all French. Although it is split into French and Basque, I’d expect more since it’s half of my genetic makeup. I wonder if some of my French DNA might be mixing with the Iberian. There are different Admixture projects to choose from. This is the MDLP K11 Modern. I am not entirely sure what all the abbreviations in the legend mean. But, I have a whole lot of DNA from Neolithic. Hey, I’m learning along with the rest of you! 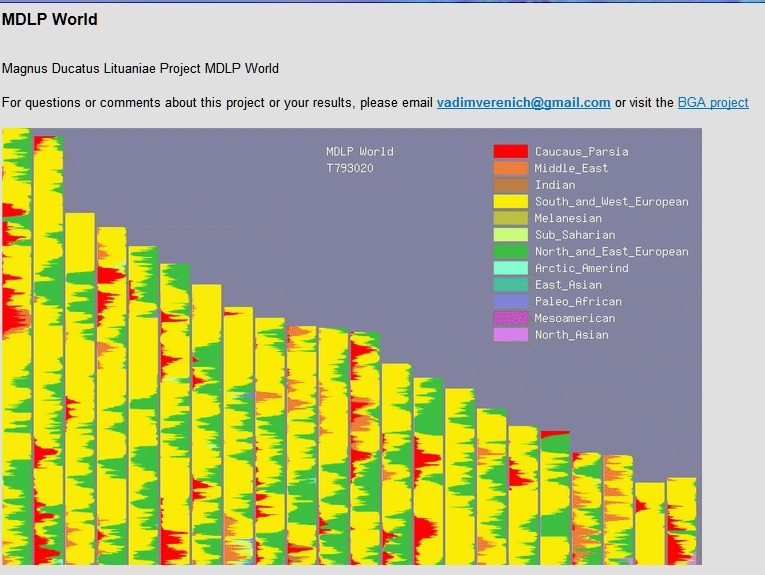 The MDLP World utility coves 12 regions. This one makes sense to me. It’s dominated by yellow which represents South and West European. These utilities help you explore your DNA test results from different perspectives. I imagine as more and more people test these utilities will become even more exact. The larger the sampling the better they will be. 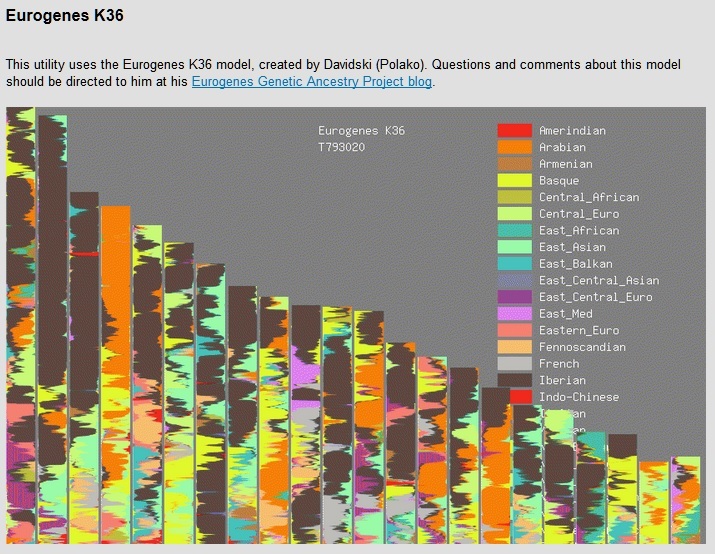 Have you played around with GEDMatch’s chromosome mapping utilities? If so, what did you think of the results. Did the results surprise you or did they represent your ancestry correctly? If you haven’t, go play! Want to better understand you DNA results? Genetic Genealogy: The Basics and Beyond gives background on what types of tests are available and how to interpret your results. The high percentege of iberian that you have comes mainly from your father. I am basque and have a lot of the iberian component (49%) in the Eurogenes K36 test, which is common in all basques. I’m glad to see that other Basques show the same percentages of Iberian. I suspected that my dad’s side was the culprit but it’s difficult to know without comparing to others.